Folch was an intern in the Office of the Associate Librarian, where she provided general support for Ransom Center programs and services. She was a graduate student in the Program in Comparative Literature at The University of Texas at Austin. 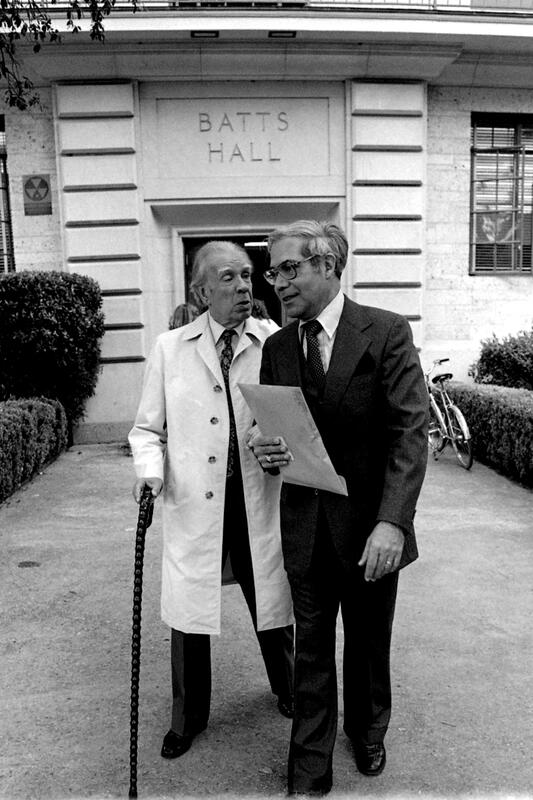 Jorge Luis Borges with Dr. Miguel Gonzalez-Gerth at The University of Texas at Austin. Photo by Larry Murphey. In the short essay “La biblioteca de Robinsón” (“Robinson’s Library”), an unpublished manuscript recently acquired by the Ransom Center, readers can now discover Argentinian writer Jorge Luis Borges’s take on this issue. Despite the slightly facetious title, Borges considers the task of selecting these life-sustaining texts rather seriously. The act of reading was essential for the erudite author, who in fact claimed that his had been “a lifetime dedicated less to living than to reading,” adding in his poem “A Reader”: “let others boast of the pages they have written; / I am proud of the pages I have read.” Libraries were of primordial importance to him, and in his “Aubiographical Essay,” he remarked that “if I were asked to name the chief event in my life, I should say my father’s library.” Although he frequently contributed to literary magazines in Buenos Aires and had become an established writer in his forties, Borges was forced to take on a job as cataloger for 10 years at a minor municipal library. The Perón regime to which he was opposed later fired him and appointed him Inspector of Poultry and Rabbits at a public marketplace, a position that Borges declined, declaring himself incompetent. To remedy this humiliation, after Perón was deposed in 1955, the writer was appointed director of the National Public Library in Buenos Aires, although, ironically, by this time he was almost completely blind due to a congenital eye disease. Repeatedly nominated for the Nobel Prize, rumors have it that his conservative political views kept him from winning the award. Borges visited the United States for the first time when he held the Tinker Foundation visiting professorship at The University of Texas at Austin from 1961 to 1962, and, after the death of his mother, with whom he had a very close relationship, he travelled widely, giving lectures on literature and writing. Borges’s fiction often turns into mystical disquisitions that lend themselves particularly well to the essay form, in which his intricate style shines through with polished eloquence. The manuscript of “Robinson’s Library,” which is signed by Borges and displays his small neat handwriting, is dated circa 1940, at a time when the author’s eyesight was starting to show signs of fading. Given his obsession with books as repositories for knowledge—both actual and potential—this brief piece is a rare exercise in minimalism. 1September 22, 1900. The New York Times. 2Translated by William Goldbloom Bloch in The Unimaginable Mathematics. Oxford UP, 2008. 3This theme is explored in the collection of essays Borges y la matemática (Borges and Mathematics, 2003) by Argentine mathematician and writer Guillermo Martínez, and books such as The Unimaginable Mathematics of Borges’ Library of Babel by William Goldbloom Bloch (2008) and Unthinking Thinking: Jorge Luis Borges, Mathematics, and the New Physics by Floyd Merrell (1991). 4Borges, Jorge Luis. Texas. Trans. Mark Strand. Austin: Humanities Research Center, UT, 1975.